The other day a study group asked me to address them at their meeting. Their theme was ‘Agriculture 2050’. The topic I had to discuss addressed the importance of relationships and values during negotiations. This was not an ordinary presentation with a few graphs and projections. These men were definitely thinking deeply about the future. I spent the week before the presentation in Botswana. During this time I studied the survival of nature to allow me to compile something valuable for these men. What drew my attention was how plants and animals adapt to their environment to survive – and even to multiply. I was unable to find committees of plants and animals sitting around for hours, reflecting on how to change the environment. Plants and animals find ways to survive – and even prosper – by becoming experts in adapting to their environment – which they cannot change at all in any case. This led me to thinking about how much time Grain SA spends on trying to change the environment, and how much time is spent on supporting producers to survive and flourish in the existing environment. Some members of senior management recently attended overseas congresses in their fields of expertise and returned with great excitement. 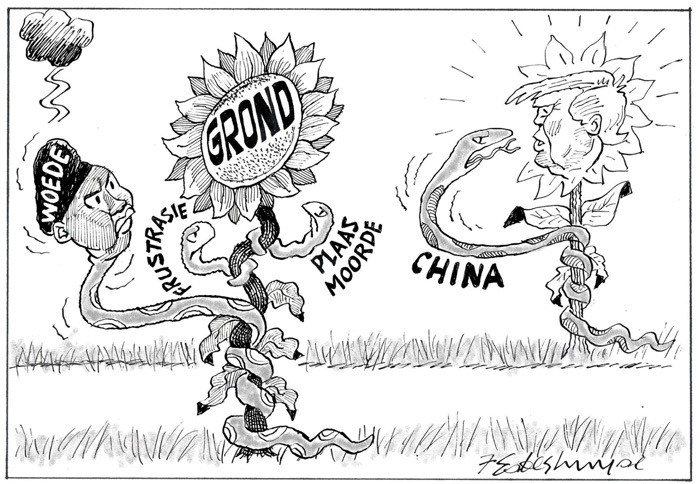 One message about which all of them were particularly clear, was: While South Africa is involved in internal matters (and politics), the rest of the agricultural world is adapting to changes in their environments. Adjustments are made on the basis of the influence the new trade war between the USA and China will have on others. South Africa’s producers will not be able to keep their eye on the local political ball only, but will also have to observe narrowly what is happening in the rest of the world. We will have to make adjustments. I realised once more that we as producers have the minimum impact on the environment and can do relatively little to improve this. The focus should rather be on how to survive and flourish within the environment in which we produce grain. The current uncertainties in our country are driven by two particularly strong emotions: Fear and anger. These are virtually irreconcilable emotions in any meeting. There are those who fear all the uncertainties with respect to safety and what is going to happen to their farms, and there are those with anger about the past and frustrations because they cannot free themselves from the grip of poverty. There are really very few people with answers to the situation. I am still searching for them. Yet, somewhere between all the noise, a small flame of hope has once again flared up. The Presidency is relatively interested in seeing a plan for agriculture – something similar to the one the motor vehicle industry drafted and implemented a few years ago. That truly was a partnership that was very fruitful for the South African economy. I just hope that we as leaders in agriculture will not become too busy with each other in the process. It is time to co-operate and go forward – if we get the chance.